• In Europe, the Volkswagen brand delivered 130,900 vehicles, 1.8 percent up on the same month last year. The situation in Western Europe in February was also positive. All in all, Volkswagen delivered 110,600 vehicles here, corresponding to an increase of 2.5 percent compared with the previous year. In the UK, sales grew especially strongly, with a rise of 16 percent. • In its home market of Germany, the Volkswagen brand also completed February with growth in sales which was stronger than the overall market: 42,300 new Volkswagen vehicles were handed over to customers, 3.4 percent up on the same month of the previous year. The Tiguan family with 5,700 deliveries, the Polo with 5,400 deliveries and the new T-Roc with more than 4,500 deliveries developed especially positively. • In Central and Eastern Europe on the other hand, there was a slight fall. In February, Volkswagen handed 20,300 vehicles over to customers, down 1.9 percent on theprior-year month. Once again, Russia proved to be an especially strong market for Volkswagen. Here, the brand handed 7,300 vehicles (+3.9 percent) over to customers. • In North America, Volkswagen handed over a total of 40,200 vehicles to customers, corresponding to a decline of 4.2 percent compared with February 2018. In the USA, Volkswagen recorded a drop of 3.6 percent, with 25,700 vehicles delivered. The brand’s bestselling model was the Tiguan, with 8,100 vehicles delivered. SUVs accounted for more than half of the Volkswagen vehicles handed over to customers in February. The new Jetta also continues to sell very well, with deliveries up by 55 percent. In Mexico, the situation remains difficult; deliveries fell by 7.3 percent compared with February 2018. • The South America region remained on track for growth following the slight dip in January. In the region, a total of 32,300 vehicles were delivered in February, up 45.6 percent on the same month last year. This growth is solely due to the largest individual market, Brazil. Here, 24,200 customers took delivery of a new vehicle from Volkswagen, representing growth of 143.3 percent. The reason for this enormous rise, in addition to the very good performance of the brand, was the changeover to a new internal reporting method for South America. In Argentina, the decline in the overall market continued as a result of the tense economic situation. Deliveries by the Volkswagen brand were also affected. 46.9 percent fewer vehicles were handed over to customers than in the prior-year month. • In the Asia-Pacific region, Volkswagen delivered 183,900 vehicles, down 8.6 percent on February 2018. Overall developments were largely determined by the general market situation in China, which continues to be tense. Customers there remained reluctant to purchase. 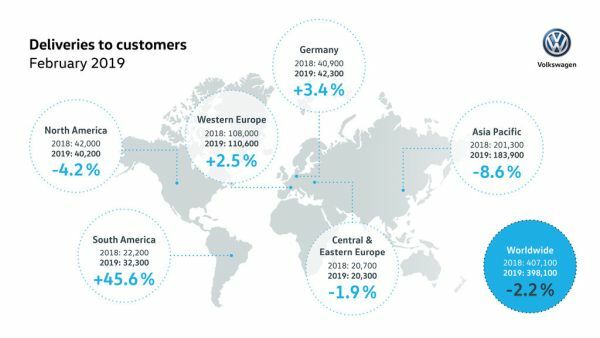 Nevertheless, Volkswagen succeeded in expanding its market share, with 172,500 vehicles delivered (-8.8 percent) in February.